Create a beautiful 4-sided lantern that can be hung up or placed on a table. 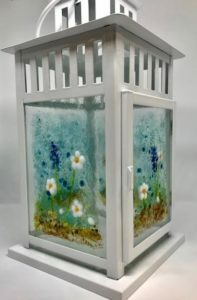 Students will be provided with clear fusing glass panels cut to fit each side of a metal lantern plus a variety of colourful stained glass rods, stringers, noodles, frits and “pebbles”. The course fee includes all materials required plus kiln firing.